Here’s my latest batch from the LPL – defeated by the very excellent Bugsda. Interestingly I’ve not won a round since I started taking scenic shots instead of light box shots. Hmmm…. You’ll have seen the main bloke in blue a couple of weeks ago – I realised he reminded me of Tin Tin, so built the rest of the group around that idea. 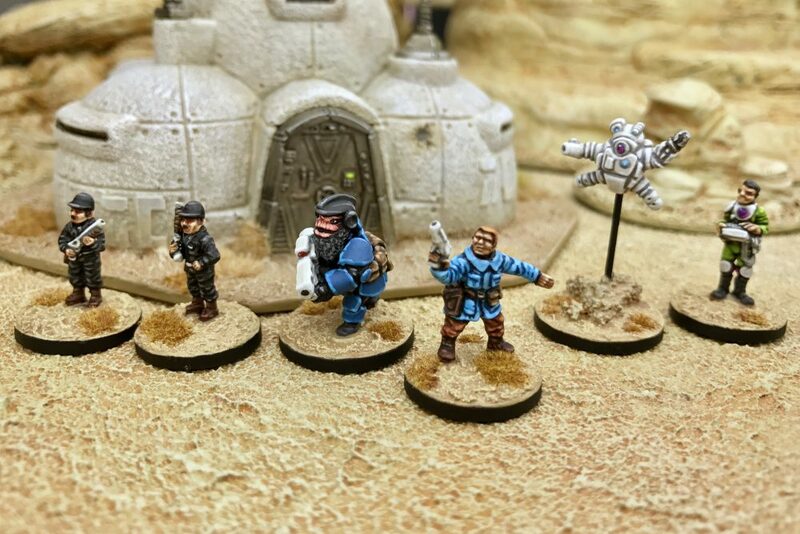 I’m pleased with all the minis – cant help but feel that Professor Calculus (or ‘Kalkloos’ as I’m spelling it, for ‘sci-fi’ purposes!) didn’t quite capture the concept as well as he could have, and the white ties him to SN0-WY too much (looks like he’s controlling it). As characters for my general Sci-Fi collection though, they’re all good additions. You losing has less to do with you, than with your competition. The ones you’ve met has been outstanding. Although I would recommend to vary your backdrop terrain if possible.